The trees kept calling to me to stop and take their pictures yesterday, turning what should have been a five-hour drive into six hours. I think it’s just been too long since I took a walk in the forest, and when I saw some old friends, it wasn’t possible just to give a glance and continue on my way. The buckeye first caught my eye; it’s a tree I dislike at other times. 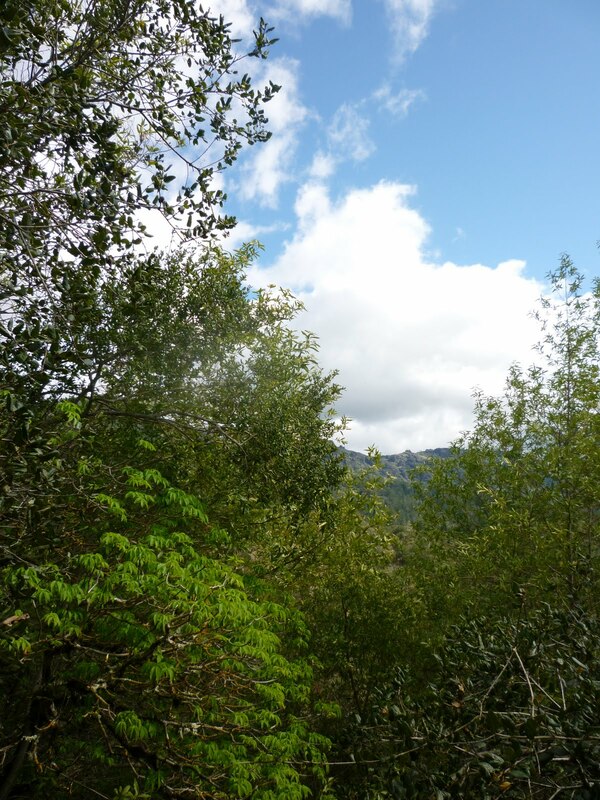 In the late summer, when the world is full of lush greenery and flowers, its leaves turn brown and spoil the landscape. But when humans are saying, “I’m ready for Spring,” and it’s still February, the buckeye, or horse chestnut, puts on its party clothes way ahead of time and is, for a while, the prettiest one. The California Bay Tree is dear to my heart. 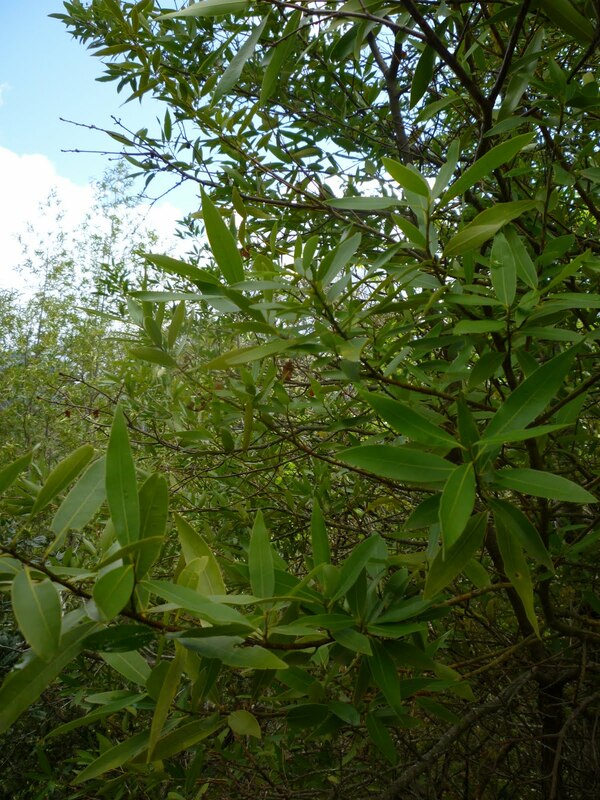 Until I moved to Northern California I didn’t know anything of it, though I had probably at least heard of bay leaves for cooking. Since then I’ve seen what may be the biggest bay tree on earth, and I’ve stuck many a spray of leaves into my flour buckets to keep out bugs. 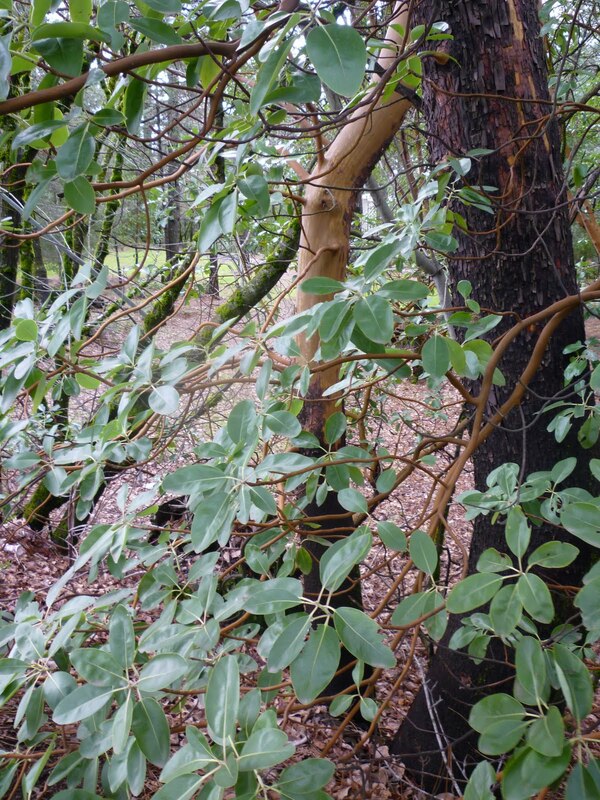 In Oregon they call this tree the Oregon Myrtle, and some people know it as Pepperwood. The usual leaves you buy in a jar for cooking are milder and come from a different tree altogether–though the California “bay” leaves that I can gather on my walks have been good enough for this culinary make-doer. Here’s another picture of the bay with a live oak backdrop. 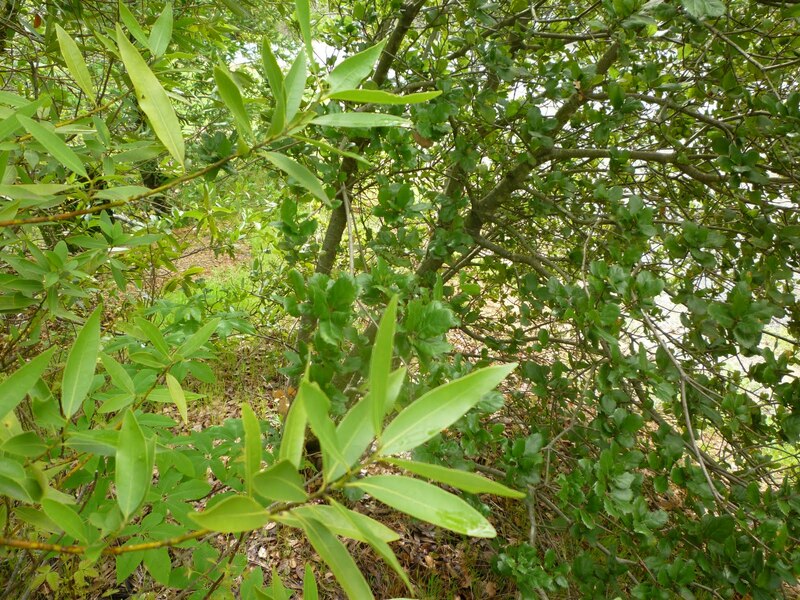 Which live oak? I couldn’t tell you. Once I decided I would learn about all the oak trees in our area so I could know what I was looking at, and I brought home a stack of botanical books from the library. I quickly discovered that if I took on that project I wouldn’t have time to look at any other trees, much less cook meals or do laundry. My daughter told me it was a live oak–otherwise I’d have left out this picture. 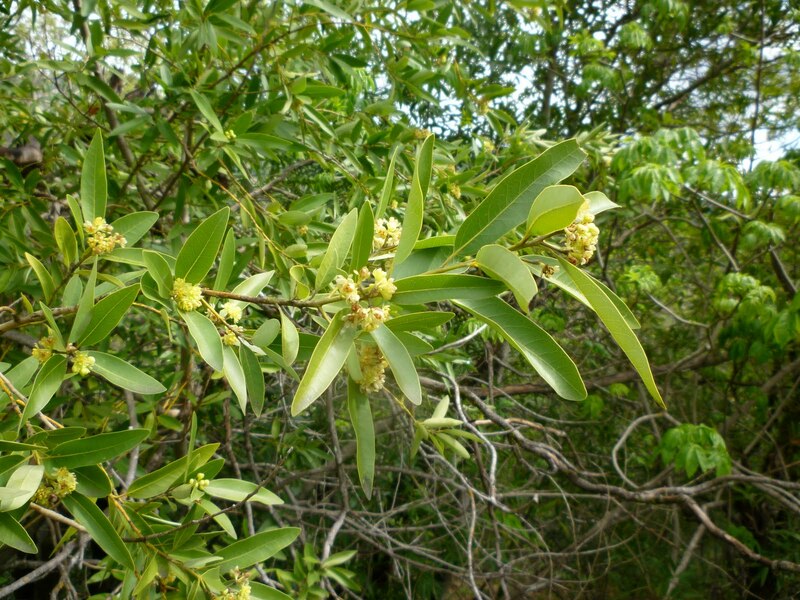 This bay tree has full flowers on it…which makes me wonder if some are male and some female; but the Wikipedia article on this species doesn’t say anything about that. 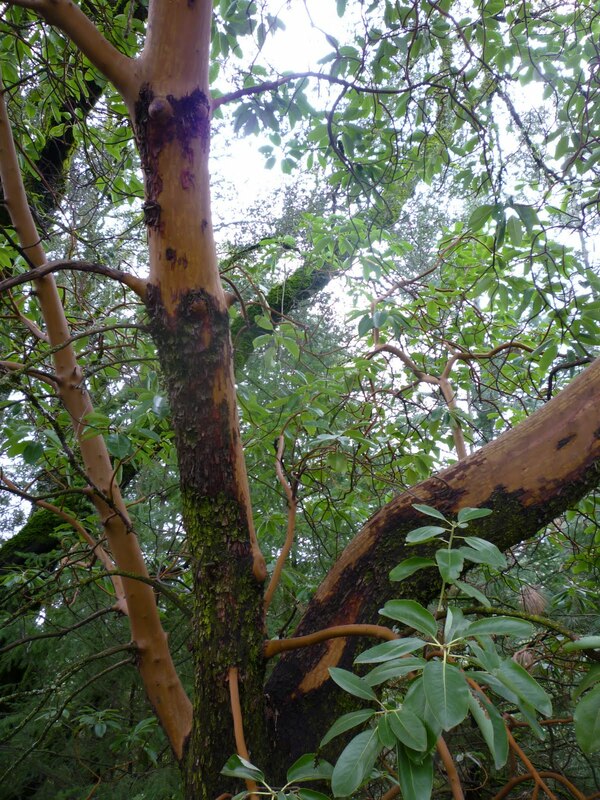 The handsome Pacific Madrone trees, which I’ve always known just as Madrones, it turns out are related to the Strawberry Tree in my own back yard, as they are both arbutus. I have to give two photos to fully show the beauty of the leaves and smooth orangey branches. 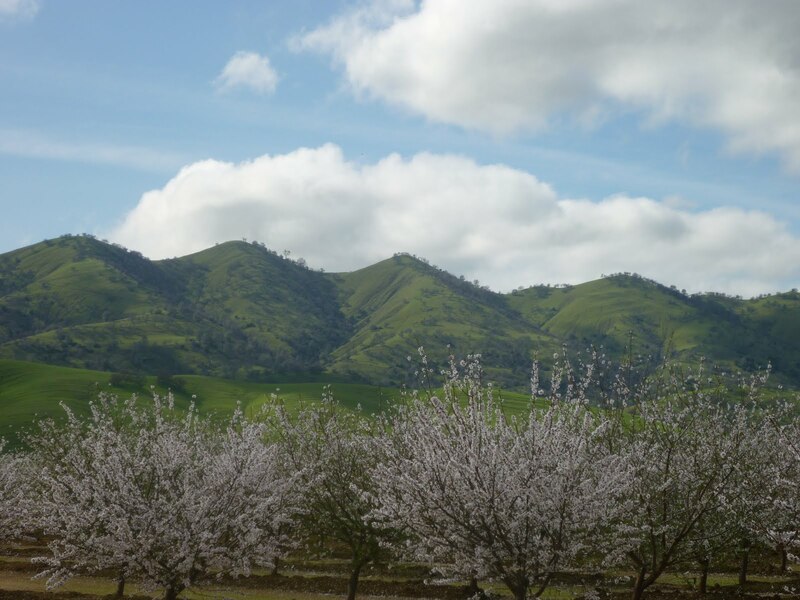 I emerged from the forest into the broad Central Valley of California, to the lovely display of barely pink almond blossoms. These are younger trees than the ones I photographed last month, but in the same neighborhood. And the clouds, and the blue sky! Going north on the interstate, with the wide flatlands spreading out on either side of me, the ceiling was huge and broad. Dark clouds piled up like stair-stepping plateaus, and then disappeared behind me. I so wanted to catch their drama with my camera, and I’m ashamed to say I’d probably have tried while zooming along the freeway, but by then my windshield was too buggy. I had to find a likely exit, where there would be a nice view, and a place to park. 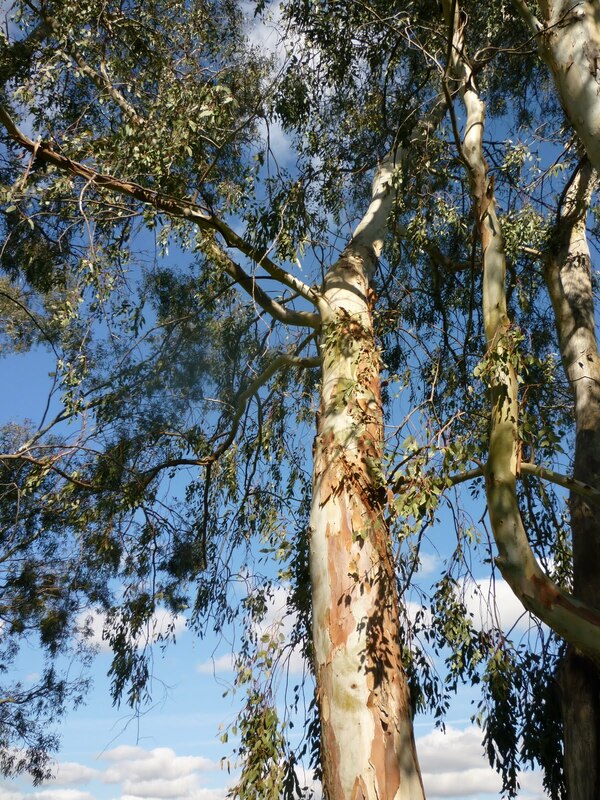 The first public rest area had a tall chain link fence all around it and not a very good look at the sky, but even the scraggly eucalyptus seemed lovely to me that day. 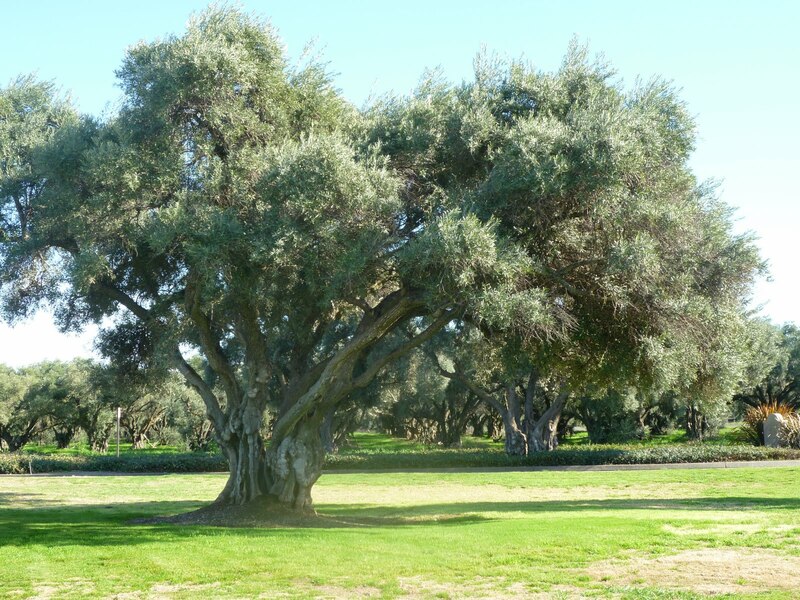 The almond trees gave way to old olive orchards, and I do love olive trees, so I stopped at another rest area that had been plopped into the middle of an orchard. I wandered around for quite a while, admiring these old stalwarts. 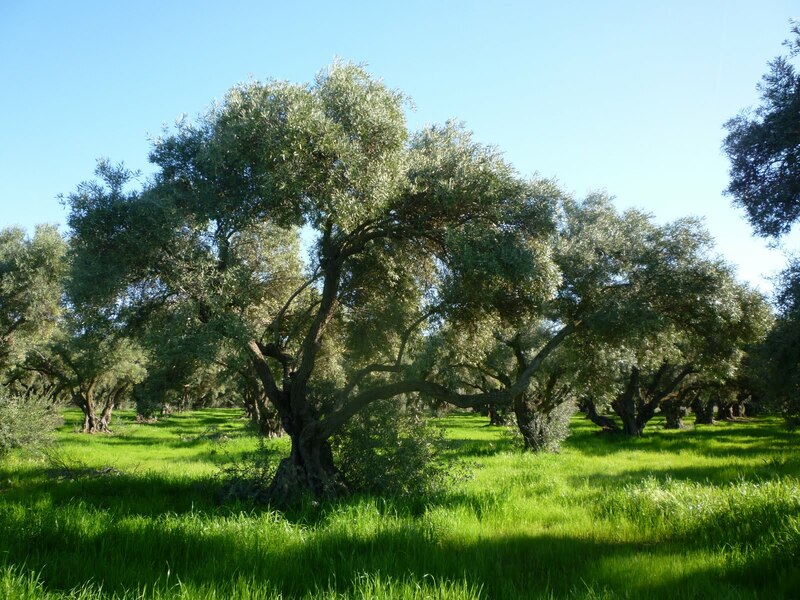 Olive trees can live thousands of years, but these are probably just over a hundred years old. Lord, water me with Your mercy and make me like my tree friends. No Ents about on this journey? These are so pretty and so heartening this time of year. Thank you for prolonging your trip to take these and share with us. Gorgeous. Thanks for these pics. The beach in Santa Barbara has been calling my name too, but I'm 1000 miles away. I can hear it pretty loudly, though. I'm rather Entish in my love for trees too. I especially liked the olive trees. Beautiful pictures! I love trees, too. My street is lined with oaks, and sometimes, if I'm walking toward home in the late afternoon, it's like walking through a cathedral. It is easy to see in these photos why people love California. as if they were just waking from their long winter's sleep. They remind me that spring with it's glorious colorful pageant is coming. On returning home after visiting with you last month, the memory of my initial acquiantance many many years with the Buckeye brought to mind the joy of discovery. How beautiful and wonderful God's creation is! I'm glad your tree friends are my friends too. I really like how you take the time to stop and capture the beauty of the trees as you travel. The application from His word brings it all together wonderfully. Thank you for this post. It made me happy.